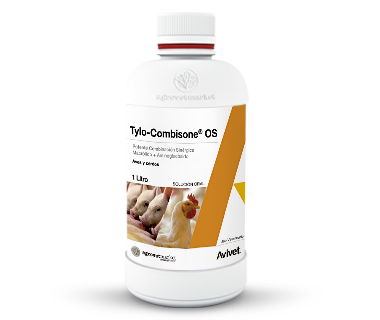 Tylo-Combisone® OS is a macrolide synergistic antibiotic association + aminoglycoside, ideal for the treatment and prevention of the processes caused by microorganisms sensitive to tylosin and gentamicin. The sociation acts in an additive manner. Tylosin is an antibiotic macrolide with bacteriostatic action mainly against Gram (+) bacteria such as Campylobacter, Mycoplasma, Pasteurella, Staphylococcus, Streptococcus and Treponema spp. Gentamicin belongs to the group of aminoglycosides and has a bactericidal effect mainly against Gram (-) bacteria such as E. coli, Klebsiella, Pasteurella and Salmonella spp. The bactericidal action is based on the inhibition of bacterial protein synthesis. Indicated in cases of chronic respiratory disease (CKD), pneumonia, bronchopneumonia, enteritis, gastroenteritis, white diarrhea, dysentery, mycoplasmosis, arthritis, mastitis-metritis-agalactia (MMA), among others. Poultry: 1 L / 2 000 L of water, 1 to 2 times during 3 - 5 days. Swine: 1 L / 2 000 L of water, 1 to 2 times during 3 - 5 days.